George Garthorne (English), Monteith, 1688. Milwaukee Art Museum, Purchase, Virginia Booth Vogel Acquisition Fund. Photo by John R. Glembin. ‘Tis the spirit! There are spirits of Christmas past, jolly good tidings and spirits of the season, and then my favorite type of holiday spirits: The beer, liquors, and wines that keep us jolly through office parties and family reunions. In what started as a playful nod to seasonal parties, I thought I’d highlight a late 17th-century silver monteith in the Museum’s Collection. But what started as a jolly excuse to talk about wine consumption then and now soon turned dark, as often happens when you dig deeper into the layered meanings of cultural objects. What is a monteith? Merriam-Webster says “a large silver punch bowl with scalloped rim.” That straight-forward definition leaves out the fun of the form, because a monteith has a very specific function. 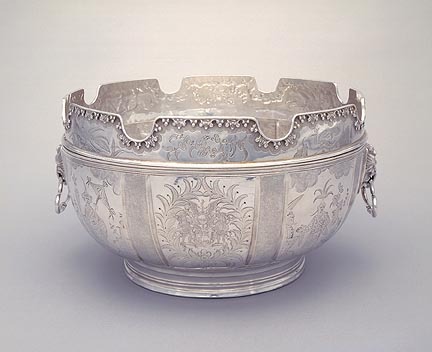 This unique and grand silver form was filled with ice water (itself a luxury in the late 17th century), and wine glasses were suspended around the rim. The bowl of the wine glass rested in the ice, giving the glass a nice chill, and the stem and foot of the wine glass rested on the unique scalloped rim. Excellent for a party. Detail of the Royal African Company coat-of-arms. George Garthorne (English), Monteith, 1688. Milwaukee Art Museum, Purchase, Virginia Booth Vogel Acquisition Fund. Photo by John R. Glembin. This beautiful bowl carries the symbol of the Royal African Company, the company with a government-granted monopoly over the English trade of African slaves from 1660 until 1698 (when it lost its monopoly but continued trading.) In the 1680s, when this bowl was made, the Royal African Company was transporting 5,000 human slaves per year. The company was hugely profitable to its London backers in the 1670s and 1680s. 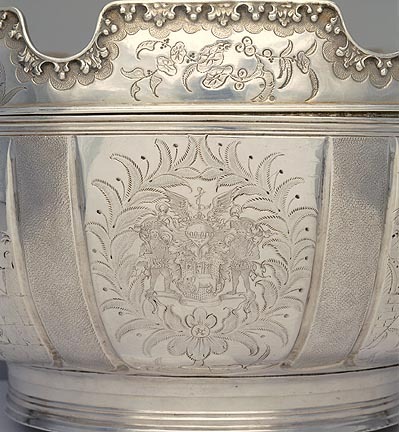 See this silver English monteith in the Museum’s Gallery 7, with European art. This entry was posted in Art, Curatorial and tagged 17th Century Art, Decorative Arts, From the Collection, silver, slavery. Bookmark the permalink.